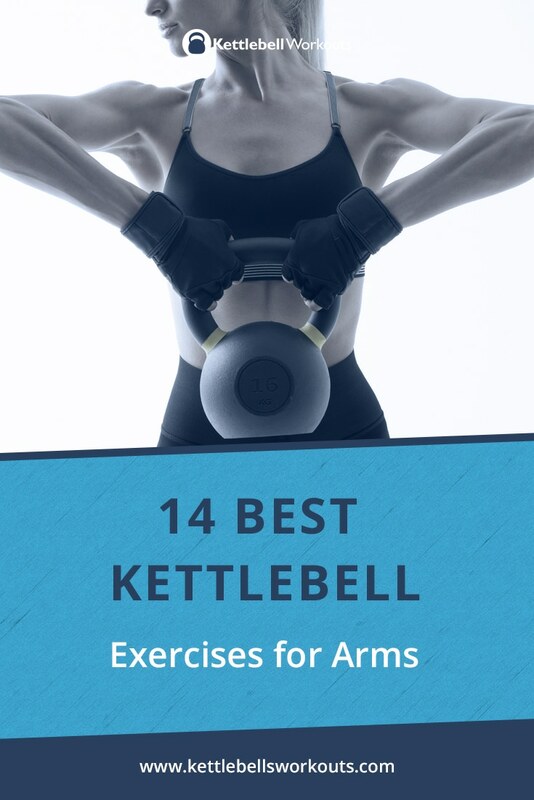 14 Best Kettlebell Exercises for Arms and Fat Loss Too! 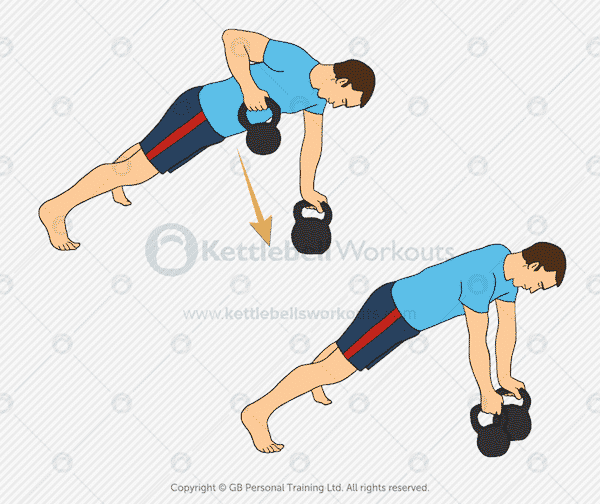 It is possible to use Kettlebell Exercises for the arms but it is very important to understand that kettlebells are not used like classic bodybuilding exercises. Kettlebell training should be focused on movement patterns and not particular muscles. If you want to just develop or add size to the arms then classic biceps curls or tricep extensions using a dumbbell or barbell would be a better use of your time. Kettlebells when used correctly focus on the entire body and so treat the body as one complete functioning unit. 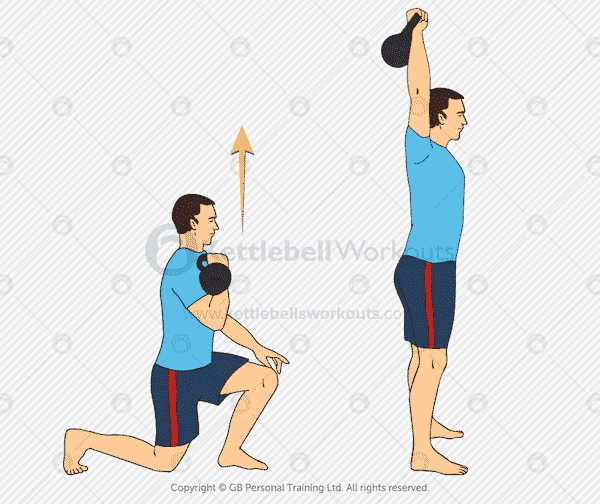 In other words, most kettlebell exercises will develop the arms just because the arms are being used as an extension to the body. 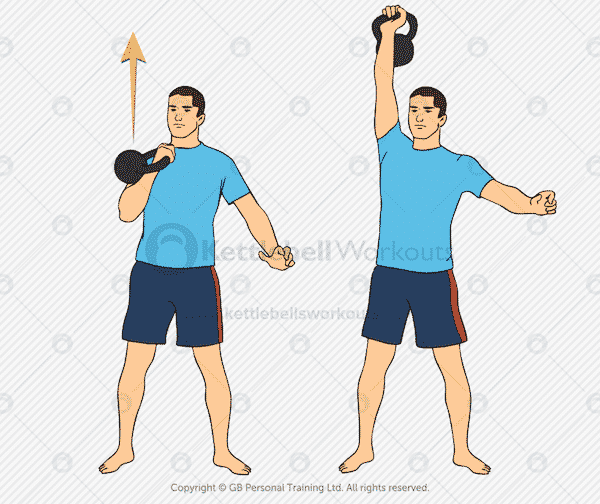 However, that being said there are some more focused kettlebell exercises for the arms. Whenever you press, extend or straighten the arm you use your tricep muscles. So Push Ups, for example, are a classic exercise for developing the triceps. If you are not using the Push Up in your training then I highly recommend that you start not only for your triceps but for your chest, abs, glutes, shoulders and back. The classic overhead press can be performed with most pieces of equipment but it feels particularly good with a kettlebell. The Push Press is a little more technical than the overhead press and is a technique used to lift heavier weights and also additional repetitions when the arms are getting tired. The Push Press uses the body to help pop the kettlebell out of the most difficult part of the movement. 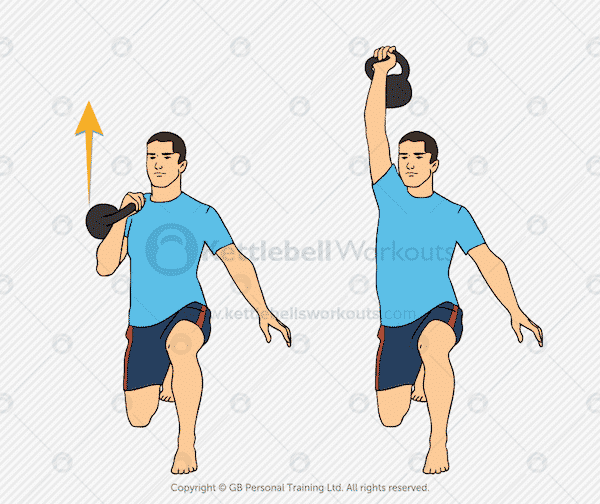 When the kettlebell is at the bottom your arm is at a mechanical disadvantage so by using the legs slightly you are able to give it a little boost out of this sticking point. If you want to really focus in on the arms and shoulders then the Tall Kneeling Press will take the lower half of the body out of the equation. A great exercise for developing pure pressing strength. You will need to keep your Glutes squeezed tight to ensure you don’t lose alignment and stress the lower back. You can also challenge your core a little more by pressing overhead from the Half Kneeling position. Have fun with this exercise by pressing from different sides with different legs forwards. You will find the natural cross body, right arm and left leg forwards, the easiest variation. Keep an eye out for your weaker side and practice to develop equal strength on both sides. The bicep muscles are activated whenever you pull something towards you so the classic exercise would be the bicep curl. However, when kettlebell training we do not waste our time with isolation (bodybuilding) based exercises like the bicep curl when we can target 100’s of muscles in one go. 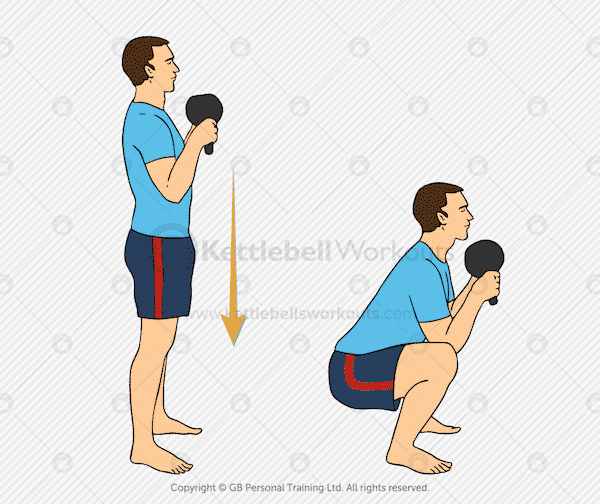 The squat is a huge full body movement that targets so many of the body’s muscles and when the kettlebell is held in the Goblet position it targets the biceps too. 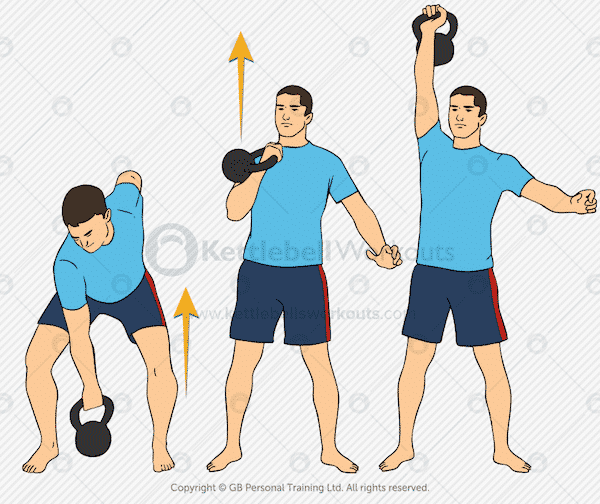 You won’t get huge bicep muscle activation from this exercise but it does demonstrate that simply holding a kettlebell in a certain way will condition the biceps too. A superb exercise for working into the back of the body and core muscles as well as conditioning the biceps. Good form and technique is required to avoid excessive momentum and to ensure that the back is kept safe and flat. 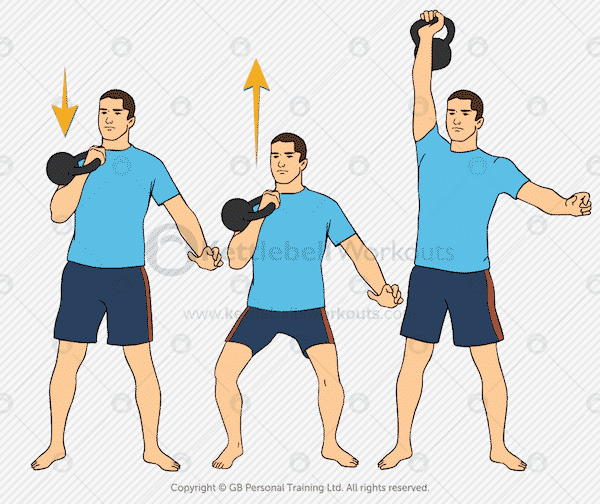 A similar exercise to the regular row above except even more emphasis is placed on the arms. The body is kept in an isometric position meaning that the muscles are working against each other in order to maintain position. Isometric exercise positions like this one are especially demanding on the full body and require good concentration. 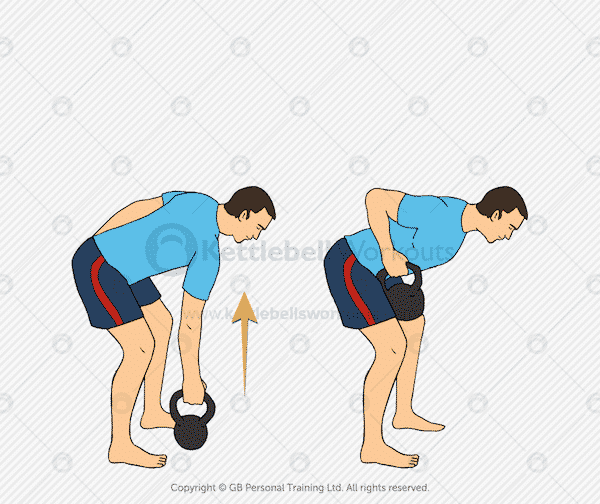 The bottoms up clean is an excellent kettlebell exercise for improving alignment of the body, warming up before other exercises and also working into the bicep muscles. Make sure to practice on both sides and improve your weaker side to ensure balance throughout the body. The plank row is a very challenging exercise for the core muscles as well as the back and biceps. 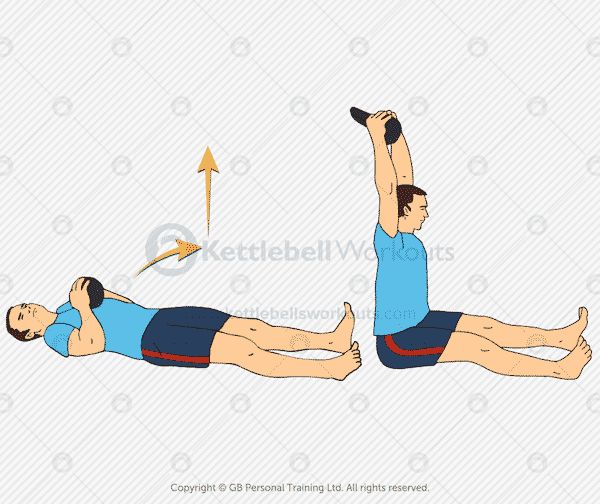 If you cannot hold a good front plank for at least 60 seconds then I would focus on that first and practice the other kettlebell exercises for the arms listed above before using this one. 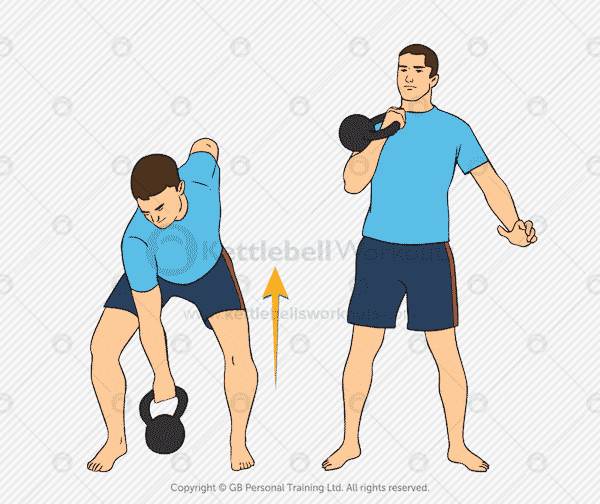 The kettlebell clean is one of the fundamental kettlebell exercises and is used to take the kettlebell from the floor up and into the racked position against the chest. Good kettlebell clean technique should use the hip snap in order to ‘pop’ the kettlebell up into the racked position. Beginners often overuse the biceps during the clean movement but there is bicep activation during the exercise. A good set of heavy kettlebell cleans will certainly overload the biceps and improve the look of the arms. 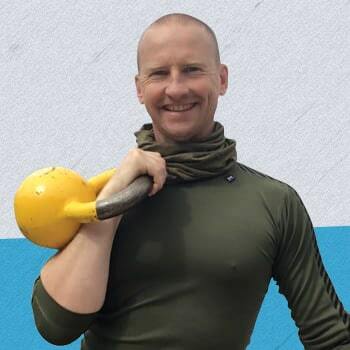 As mentioned earlier kettlebell training should be focused on movement patterns, rather than individual muscles, and by doing so targets 100’s of muscles at a time. There is a good reason why the Kettlebell Clean and Press is such an impressive exercise combination. As you have seen above the Clean exercise works the biceps and the Press exercise targets the triceps. In addition to the arm muscle activation the Clean and Press also targets almost every muscle in the body making it an excellent full body conditioning exercise and superb for fat loss. There is only one precaution, the Clean and Press is a complicated and more advanced exercise so the individual components of the Clean and then the Press should be mastered first. Similar to the Clean and Press, the Squat and Press is a huge full body exercise that targets most muscles of the body. You won’t get as much bicep activation with this exercise as the Clean and Press but you will find it more cardiovascular. 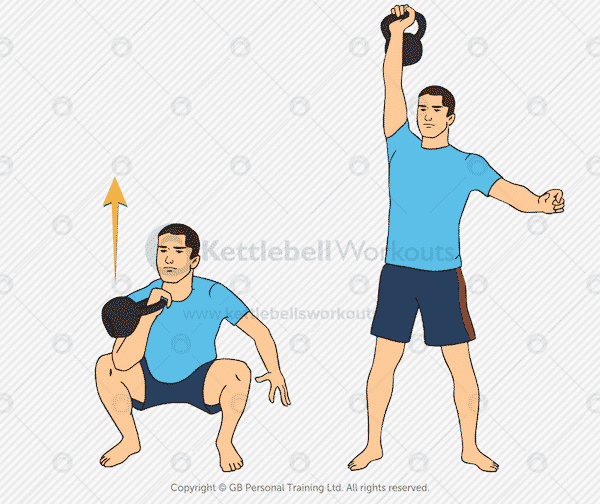 An advanced and more highly demanding kettlebell exercise than the other two exercises listed above. Again very little bicep activation but great for the triceps and the rest of the body, especially the buttocks and legs. The sit and press exercise is a powerful shoulder and tricep exercise that also works into the core muscles. 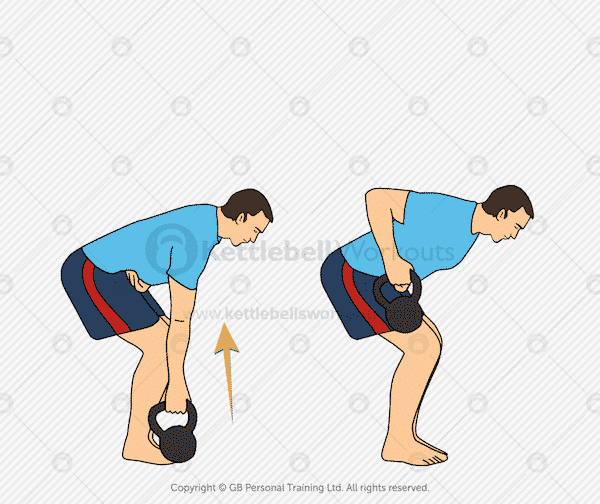 It is very important when performing this exercise to lower the kettlebell to the start position slowly. The slower the lowering please of the sit and press the more core activation you will receive. The Sit and Press exercise is also excellent to perform after one of the other pressing exercises listed above because the two handed holding position is stronger than the one handed and so means you can continue to fatigue the triceps when regular overhead presses are not possible. Kettlebell training is different from bodybuilding style training. Kettlebell exercises are based on movement patterns and so target the whole body rather than a select few. Even though kettlebell training does target 600+ muscles per exercise there are certain exercises that do target the arms more than others. I’ve listed above the kettlebell exercises for the arms that focus on the triceps, biceps and those that use big combinations to get a lot done in one big movement. To develop tone and muscle I’d recommend working on a repetition range of between 8 and 15. The challenge is to find the correct sized kettlebell for each exercise so that you fatigue during this repetition range. 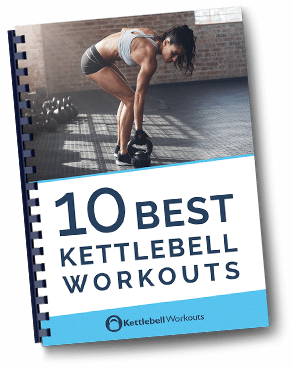 Have you tried any of these kettlebell exercises for your arms? Let me know below…. Hey Greg, I’m a great fan of the Kettlebell clean and jerk too! It has drastically increased muscle mass. I also do a variation of your sit & press where I use a medicine ball instead of sitting on the mat. One of the best for biceps that I have found is the Round the World movement. 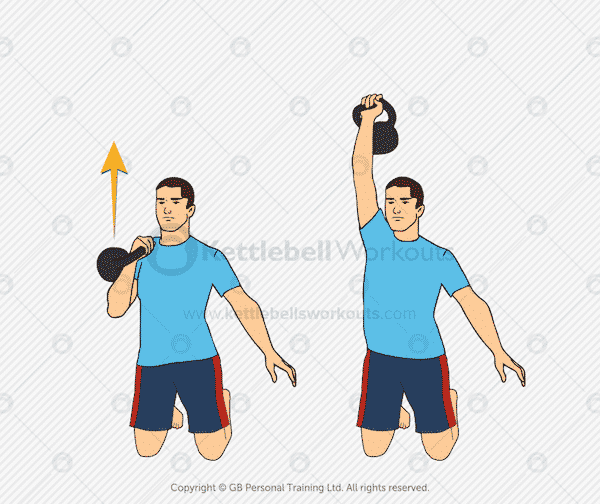 Done with a heavy kettlebell, 24kg +, this really focuses on the bottom half of the biceps when the arm is curled slightly when coming round to the front of the body. I get DOMS every time. Yes totally agree Peter and excellent for the forearms too. I call that exercise the Slingshot. 1. Should the KB be close to,the body as it goes around or should the rotation be wide? Does one work harder than the other? 2. Is it correct to “get doms every time’? I’ve tried to get PTs to,answer this but answers are not consistent. If you work hard you might expect doms, especially if you ramp up the weight or reps.
So,they shoul accommodate the effort without resulting in doms – shouldn’t they?? 2. No you shouldn’t get DOM’s every time unless you are using different exercises or loads. DOM’s are predominantly caused by the eccentric part of the exercise, so when your muscles are lengthening under load. With this in mind it is important to not overload the body with eccentric movements like heavy lowers and explosive reductions in speed like running down hills or jumping from boxes etc.